I use the term “prayer” spiritually rather than religiously. I pray to God, whatever God is, but I call on Nature to do the energy work. I feel that it is what I call the “Powers of Nature” that change the energies, under Universal Law set in place by the Eternal. We have free will; Nature doesn’t. Nature must support us in our efforts, whether they are for good or not. Jesus is often depicted with a circular halo around his head and with what appears to be an equilateral cross behind his head, usually shaped like the Celtic cross. I believe that this cross symbolizes the two lights of the soul, that each of us has. The two beams of the cross depicted behind Jesus’ head always intersect at the third eye–symbolizing cosmic consciousness. The two lights I find attached to people intersect their bodies somewhere between the lower abdomen and the neck. In this image, notice that Jesus’ head is tilted, and the cross is tilted with his head. If Jesus is depicted on the cross and his head is tilted, the cross at his head is always tilted too. Evidently it is not the physical cross. 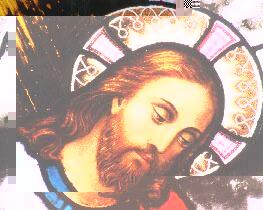 All icons of Jesus do not show the cross, but most at least show the circular halo or glow around his head. 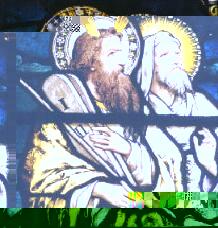 This image is called “The Transfiguration,” depicting Moses and Elijah. Notice that the beams entering Moses’ head are actually depicted as beams of light. I have also seen images of Jesus with two lights instead of the cross. This apparently depicts the light that radiated from Moses’s face when he descended Mount Sinai with the Ten Commandments, as described in the Old Testament. This image and the previous one, photographed by Will Fahnoe, are of stained glass images at the Sacred Heart Cultural Center in Augusta, GA. I have recently begun researching Christian icons and I have learned that the cross and the glow at Jesus’ head is called the nimbus, also called the “Crown of Light.” The cross is considered to be the “light of God.” Often there are three Greek symbols on the cross, especially in Byzantine icons. The symbols stand for “I Am that I Am.” I will continue my research and welcome any information you might have.